Apologies for not posting any interesting original material in the past few weeks, I’ve been busy dealing with the holidays and the celebrations that inevitably pop up at this time of year. Today’s blog post will be about a topic I’ve become fascinated with over the course of the past two years. Have you ever wondered why stereotypical WWI German media characters from WWI always seem to have a large scar on their face? Ever wonder why they always seem to be on the cheek and always are attributed with men of high status such as generals and higher ranking officers? Well, recently I was able to purchase on eBay an inexpensive photo ($4.99) on eBay that perfectly personifies the image of a young WWI German soldier with a prominent facial scar. Was this scar the result of a bad shaving accident? In fact, the answer is exactly the opposite; this left cheek scar is the result of a deliberate action. After a solid night of internet research, I was able to cobble together an answer regarding the odd number of facial scars associated with late 19th and early 20th century German and Austrian soldiers. The Dueling Scar! Male (upper class) students who were members of fraternities of major German and Austrian universities during this time were often engaged in academic fencing which at times would, at times, become a duel between competing fraternities. These individualized duels between students eventually became a badge of honor among fraternity members – taking a blow to the face showed courage and was a lasting reminder of the fraternal bond. Since these boys were often from a higher class, it was no surprise that many eventually became officers during WWI. This act was well know during the time and eventually became banned around the time of the outbreak of the war. The ban was lifted when Adolf Hitler came to power in 1933. Many of the German officers of WWII had these scars given the fact that they were in university prior to WWI. Skip ahead to 2:50 to see the duel in action! It has been called THE GREAT WAR and THE WAR TO END ALL WARS. Today, we know it as World War One (WWI). It began in 1914 and ended with an armistice at the eleventh hour of the eleventh day of the eleventh month in 1918. The global toll had already reached nearly 40 million casualties, including American losses of 117,465 dead and 204,002 wounded. After War was officially declared (House and Senate) on April 6th, 1917 the U.S. began preparations to enter the quagmire of European trench warfare. In June of 1917, U.S. transport ships carrying nearly 15,000 U.S. troops (many from New England) in the American Expeditionary Force (AEF) approached the shores of France, these soldiers would join the Allied fight against the Central Powers. They disembarked at the port of Saint Nazaire; the landing site had been kept secret because of the menace of German submarines, but by the time the Americans had lined up to take their first salute on French soil, an enthusiastic crowd had gathered to welcome them. However, the “Doughboys,” as the British referred to the green American troops, were said to be untrained and ill-equipped, untested for the rigors of fighting along the Western Front. Earl F. Lavallee of Winooski, VT in Germany, 1918. As followers of PortraitsofWar will know, we take a great pride in providing interesting and never-before-seen imagery and narration of wartime photography ranging from the American Civil War to the Korean War. In most cases, I take an authentic photograph from my personal collection and work towards uncovering various details that hopefully elucidate some aspect of the photo. In this case, I worked the other way around. My familiarity with the First World War history of the State of Vermont is well known to followers of this blog as well as within my home state. One of my favorite Vermont units to serve in the war was the 101st Ammunition Train of the 26th “Yankee Division”. Only a week ago I was lucky enough to be invited into the bowels of the Vermont Historical Society storage area to inspect a series of American Civil War flags with a few colleagues of mine from work. While in the holding area I mentioned that a series of WWI groups had donated regimental flags and/or guidons to the State of Vermont in the years following the war. Montpelier, Oct. 23 – The presentation of the colors and shields of the organizations from Vermont participating in the the world war occurred this evening in the State House with some 200 veterans attending and over 400 spectators in the seats of the representative hall and balcony. Presentation of colors – First Vermont and 57th Pioneer Infantry, Col. F. B. Thomas… History and presentation of colors of 302nd Field Artillery , Color Sergeant Albert J. Seguin of Newport. History and presentation of 101st Ammunition Train Col. William J. Keville of Boston Mass. Presentation of guidon, Company E. 101st Ammunition Train, Capt. Harold M. Howe of Northfield, VT. Presentation of guidon, Company G, 101st Ammunition Train, Chester Mooney of Newport. In the above photo we have just unrolled the 101st Ammunition Train guidons from their muslin cocoons. Present are representative samples of Co. C, G, F and E of the 101st. Each of these matches with the above 1919 article. How amazing is it to read a 98 year old article about a presentation and see the EXACT pieces in living color? I’m particular excited about the Co. E guidon. I own a ratty panoramic photo taken of the unit when they returned in 1919. Click here to see ever single facial feature of the men in that group. Also, I requested that the regimental flag of the 302nd Field Artillery be brought out for photographing. Special thanks to Jonathan Croft for being the photographer! 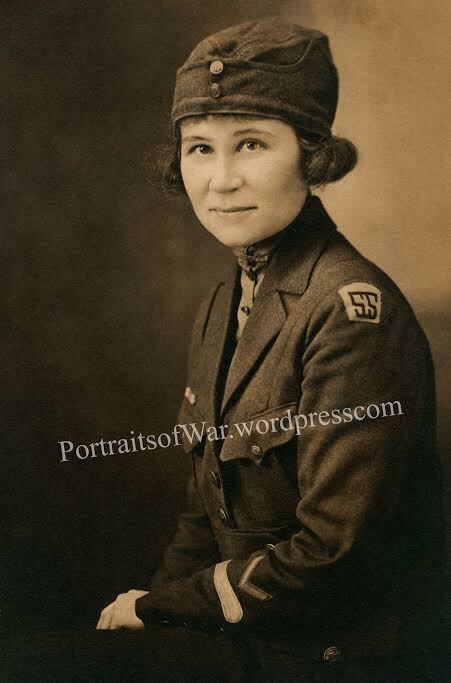 I’ve been lucky in the past few years to pick up some fun WWI shots of US female nurses and auxiliary service members photographed while serving overseas in 1918 and 1919. US women in France were vastly outnumbered by their male counterparts, and to be able to positively identify a nurse is a fun way to learn about female service roles during the war. In this case, I was able to purchase a small group of photos and a Thanksgiving menu from a woman in Base Hospital #6 stationed in Bordeaux, France during the war. The standing studio portrait was identified on the reverse as H.K. Judd of Base Hospital 6. On a whim I searched for Helen K. Judd (thinking that Helen was a likely candidate for H) and came up with a positive hit on a woman named Helen K. Judd from Southhampton, Mass. I cross referenced with the digitized passport records from 1917 and 1918 and had a positive match. Luckily the passport applications come with little snapshots of the applicants. The amount of material available to identify WWI photos is incredible. So what was served up on Thanksgiving, 1918? Given the recent cessation of hostilities on November 11th, the nurses and ailing soldiers of the AEF had a lot to be thankful for in 1918. How did they celebrate? US Dietitian Ellen W. Wells was someone who likely put together the well-rounded meal seen in the above menu. With appetizers of celery and olives, the nurses, doctors and assorted hospital staff and wounded next moved to a main course of roast stuffed turkey, apple sauce, mashed potatoes, green peas and creamed onions. For desert they gorged on mince pie and an oddity in Europe, pumpkin pie. After dinner snacks included fruit, nuts, raisins, bon-bons and coffee. And to top it all off, the men and women were provided with cigars. What a meal! Balancing work life, house chores, being social, and collecting WWI photos can be a daunting task; too much investment in one area can lead to neglect in another. As is the case of my life as of June, 2016. Luckily, I’m making a solstice dedication (is that a thing?) to posting more of my identified material in hopes of reuniting family members with deceased relatives. In tonight’s post, I’ve purchased and researched a photo in the course of one calendar week with some positive results. As you may know, veterans with interesting surnames are typically easier to identify, and this post is an example of one of these researching ventures. Elmer Reinhardt Liebig was born on November 1st, 1894 in Spink, South Dakota, the son of two German immigrants. Having served in a Quartermaster unit during WWI, he went on to own and run a pool hall in his hometown for a number of years until operating as a salesman until the 1940s, where he eventually ended up with the South Dakota Department of Fish and Game, acting as a warden for Brookings an Moody Counties.